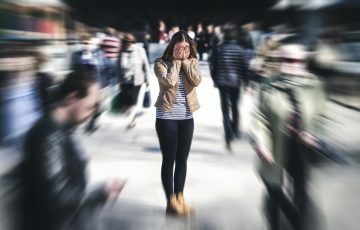 Fear may trigger changes in the body as a natural act of defense against danger, commonly known as the “fight-or-flight” response. The reactions become characterized as PTSD when a person continues to experience fear and stress responses even when not in danger. The range for the expression of PTSD is around 3 months after a traumatic event to years afterward. Other problems associated with PTSD can include panic disorder, depression, substance abuse, and feeling suicidal. PTSD can be acute or chronic, depending on the nature and duration of the trauma. Anyone can develop PTSD. Those who suffer commonly include military servicemen and women who have been exposed to combat, children, and people who have experienced assault, abuse, an accident, including natural disasters. The National Center for PTSD estimates that 7 to 8 of every 100 people will experience PTSD at some point during their life. Research has indicated that women more commonly have PTSD than men. Studies have also shown a genetic susceptibility exists that increases your chance for PTSD after trauma. Treatment options for individuals with PTSD currently involve medication, psychotherapy, such as talk therapy or cognitive behavioral therapy, or a combination of these. Every individual is different, and PTSD impacts people differently, so it is extremely important to remember that a treatment working well for one person will not necessarily work for everyone else. This is why we focus on individualized treatment for every client. Exposure therapy is sometimes an option as well, but the outcome results are often mixed. A newer treatment option called Eye Movement Desensitization and Reprocessing (EMDR) has a higher rate of success. To learn more about the best treatment options for you, call us to speak with a knowledgeable wellness professional, who can guide you toward the first step toward treatment. Studies have shown a strong correlation between PTSD and drug or alcohol addiction. A study of more than 30,000 patients based on data by the National Epidemiological Survey on Alcohol and Related Conditions showed that 20% of individuals suffering from post-traumatic stress disorder also suffer from substance abuse issues. The high rates of co-occurrence are often because individuals seek to self-medicate with drugs and alcohol. Intense flashbacks, rumination and anxiety tied to PTSD can make everyday life difficult without strategies and support to manage symptoms. This is one reason that comprehensive treatment is so important. The presence of PTSD along with a drug addiction is called a co-occurring disorder which is a core focus of treatment at Sprout facilities. With comprehensive, individualized treatment, our experienced clinicians provide dedicated treatment for both PTSD and addiction. After a personalized assessment, treatment may include medically assisted detox to manage withdrawal symptoms, and will also likely include psychotherapy and behavioral therapy. Your treatment may also include family therapy and experiential therapy, such as yoga, meditation or outdoor therapy. All programs include great attention to aftercare, which helps clients transition seamlessly toward life outside treatment. Each path is individualized to the client for the greatest long-term success. One of the hardest hurdles to overcome is choosing to help yourself and seek treatment. It is vital to remember that with time and treatment, you can get better. Most importantly, try to focus on the idea that symptoms will improve gradually over time. It can be more harmful to set unrealistic expectations for yourself, especially with creating new pressures to automatically be “okay” again. To take the first step toward treatment, call us to learn about the best path for you based on your unique experience.